Need help with your underfloor heating requirements ? the calculator below will work out a 90% coverage, the calculator assumes you require insulation and adhesive for the full room area, simply insert your skirting to skirting measurements length and width in meters and the calculator will work out what size system best suited for your room in the table below. First pioneered by the Romans, modern day underfloor heating (UHF) is now a mainstream primary heat source for many homes and workplaces. No Drafts / Convection currents! Radiators create drafts and convection currents due to the way they heat air and cause it to circulate around the room. The greater the circulation of air (see fig 2 below) the colder it feels to the occupant. UFH does not create the same convection current, instead of producing an even stable heat over the entire room area (see Fig 1 right), making the occupant feel warmer and more comfortable. Practical, User-friendly & Space Saving. UFH is hidden under the floor so takes up no room space so allows the occupant a totally blank canvas to position furniture and other items. Once installed Electric Underfloor Heating does not require any further maintenance. What boiler can offer that? Underfloor Heating heats the floor evenly making it the hottest point, it also maintains the majority of the heat at a desirable and useful level evenly spread over the room area, (see fig 1 above right). 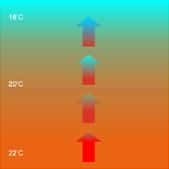 Radiators send the majority of the heat to the ceiling where it is not required and so wasted. Cold air is then dragged over the floor towards the radiator to feed the convection current, (See fig 2 above left).Studies have shown that when our feet are warm the rest of our body’s feel more comfortable. Electric Heating systems also do not require a wasteful delivery system. Up to 20% of heat can be lost in pipes that deliver hot water to and from radiators. 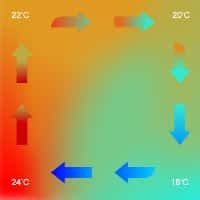 The combination of reductions in convection currents, better location of heat and heat source and less wastage mean UFH can be run at a lower temperature in comparison to radiators but still keep the occupant feeling just as warm and more comfortable. What Size underfloor heating System Should I Get? Once you have decided on what type of heating system best suits your needs (see ‘What Type Should I Use). 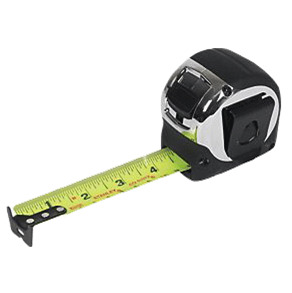 1: Accurately measure your floor area (sqm). Work out your total floor area making sure to remove any areas where heating will not be required ie under Fire places or fitted wardrobes. It will help to make a quick sketch of the floor area first and add the measurements to the sketch. 2: Decide what wattage/power you require. In most domestic environments a minimum of 150watts per sqm should be installed over at least 70% of the floor area if you wish to use the heating as the primary heat source, (170watts per sqm for under concrete and screeded floors). In areas prone to high heat loss such as conservatory’s or commercial entrance areas you may want to consider the use of 200watt per sqm systems. This is to allow extra capacity in the system for very cold periods. The system ordered should be ideally between 75% and 90% of the total floor area you wish to heat. This will allow you to easily fit the system over your sub floor but allow a narrow border around the edge of the room to run your other services/connection wires. You may note that the loose wire kits and in screed heating cable kits do not come in a set wattage per sqm packages. The listed kits are based on approximately 150watts per sqm for loose wire kits and 170watts per sqm for under concrete screed cable kits. These wattages can be increased easily to provide 200+ watts per sqm by ordering a larger kit and reducing the spacing’s between wires when laying the kits. To make sure you order the correct size when uprating the wattage per sqm installed, divide the total wattage of the chosen system by the floor area you wish to cover. This will provide you with the watts per sqm the chosen system is providing. You can then change the system/systems selected until you have the desired watts per sqm you wish to install. 4: What else may I need to measure up for. Roma thermostats are designed to be easy use and have a clean modern look. When ordering thermostats you should consider one per room area with up to 16amps of heating (load) per unit. If over 16amps of heating is installed either zone areas with additional thermostats or a relay switch can be fitted. For further information please see the ‘Thermostats’ page. The Heat film and foil systems will require additional workings to be carried out prior to ordering. Further detail on these systems can be found on their corresponding under wood and laminate pages.